This article is part of a series on 3D Printing and Intellectual Property Rights. When I proposed this series of articles I noted that most IP pieces dealing with 3D printing tended to focus on copyright although a few talked about patents and trademarks. Before I get into the meat of the various IPRs, let me provide a quick overview of the various IPRs if for no other reason because an IPR holder, with adequate legal and financial resources whose management team understands IPRs and what they can do would, or rather should look at using several types of IPR protection at once (if they can). 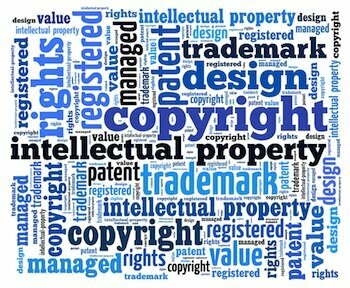 This is because each type of IPR has its own unique advantages and limitations, and by using multiple IPRs at once the limitations of say copyright (for example with respect to reverse engineering) might be addressed by another type of IPR (e.g. patents). IP law and lawyers may employ terminology that is different from the language people and in some instances, non-IP lawyers ordinarily use; terms that might seem synonymous may not actually have the same meaning. For instance the word ‘novel’ in patent law has a different meaning from the word ‘original’ in copyright law even though to most people, something that is novel ought to also be original. Copyright – which protects things like music, film, literature, performances, and broadcasts. As the term implies, problems with copyright start when there is ‘copying’ and to get copyright, the work must be original. For instance, if Jack and Jill each draw pictures of the same bridge, there is NO copyright problem because each of them is drawing their own picture. However if Jack were to copy Jill’s drawing, then a copyright problem may arise. Unlike other IPRs (e.g. trademarks, patents, design rights) copyright rights arise automatically although in some places (e.g. the US) you need to register your copyright to get maximum legal protection. Trademarks – which go to protect distinctive identifiers for products or services; think ‘branding’. What makes trademark complicated is that trademark law can cover things such as 3D shapes (sometimes referred to in the context of ‘trade dress’), sounds, holograms and smells. Sumitomo Rubber, for example, was granted the UK’s first olfactory trademark in 1996 for “a floral fragrance of roses as applied to tyres”. Patents – which protect inventive activity (i.e. ‘inventions’) and typically last 20 years. In some cases, for example with pharmaceutical inventions, patent terms may be extended. Outside the United States, there is another type of patent that lasts for less than 20 years and is referred to as a ‘utility model’, ‘petty patent’ or ‘short term patent’. To get a patent one must have an invention that is novel which in patent-speak means not in the state of the art (more on this later), has some sort of industrial utility or application, has some inventive aspect (this is referred to as ‘inventiveness’, having an ‘inventive step’ or as ‘nonobvious’), and cannot be non-patentable subject matter. Geographical indications which are ‘indications that identify a good as originating in the territory of a Member, or a region or locality in that territory, where a given quality, reputation or other characteristic of the good is essentially attributable to its geographic origin.’ Think, for example ‘Florida oranges’ or ‘Idaho potatoes’ – to the minds of some people potato comes from Idaho or an orange from Florida has a certain quality not found in potatoes or oranges from other places. Let me address the various rights that I won’t be talking about in later posts. In my opinion, until 3D printers can print live plants, plant varieties protections won’t really apply in 3D printing. I will also discuss trade secrets and the protection of commercially confidential as well as what is referred to as ‘passing off’ in Common Law jurisdictions under IPRs. Finally, some IP experts include privacy under the umbrella of IP Rights (as, for example, a leading British textbook on IPRs does). There is some logic to this, in America publicity rights evolved from privacy considerations and one’s attempt to protect one’s privacy, is not unlike a corporation trying to protect its trade secrets.